To prepare the mini tamales: Preheat oven to 350° F.
Mix the 2 cups of flour, salt, and cumin in a bowl. Add the broth and mix well. Pour the oil over the mixture and blend by hand until soft. Spray a muffin pan with cooking spray. Shape the mixture into small balls and place them into the molds. Press the dough with your fingers and shape it into a cup. For the filling: Place the oil in a pan with the onion and cook for 3 minutes. Add the chicken, the broth, tomato paste, and jalapeño. Stir well and cook for 5 minutes. 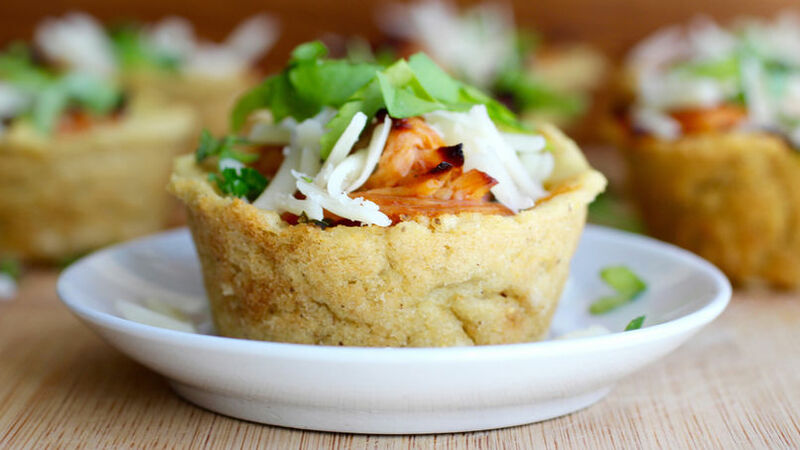 Fill each dough cup with the chicken mixture and top with cheese. Bake for 15-20 minutes. Allow the mini tamales to rest for 3 minutes before removing them from the muffin pan. Using a sharp knife, lift one side and pull out gently with your fingers. Garnish with cilantro and serve with salsa. If you don't like it spicy, replace the jalapeño with bell pepper. These small chicken tamales are delicious, and their cupcake shape is the best way of serving the dish to children. Now that we're enjoying some really nice weather, I like to prepare new foods to enjoy with my whole family. They offer a delicious contrast of flavors and a fun way of introducing green chilies to even the youngest members of your family. These mini chicken tamales are perfect for a picnic or simply for lunch.